Original way to use the beets. 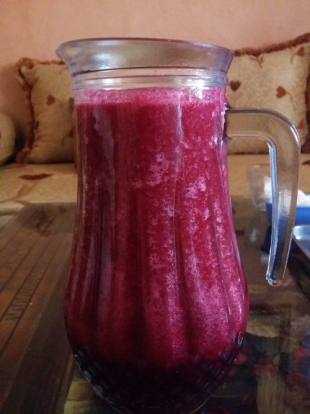 Very refreshing dessert drink during summer days. Beets are cooked and then moved to the blender to be mixed with the cooking water. Sugar and lemon juice are used to add some flavor to the taste of the beet, renowned bland. It should be served cold. Originally, it is a homemade recipe, however, we begin last years to see it in some stores. Carrots mixed in the blender with orange juice and orange blossom.